Listing courtesy of Lynn Teschner (CalBRE #01260831), The Agency. 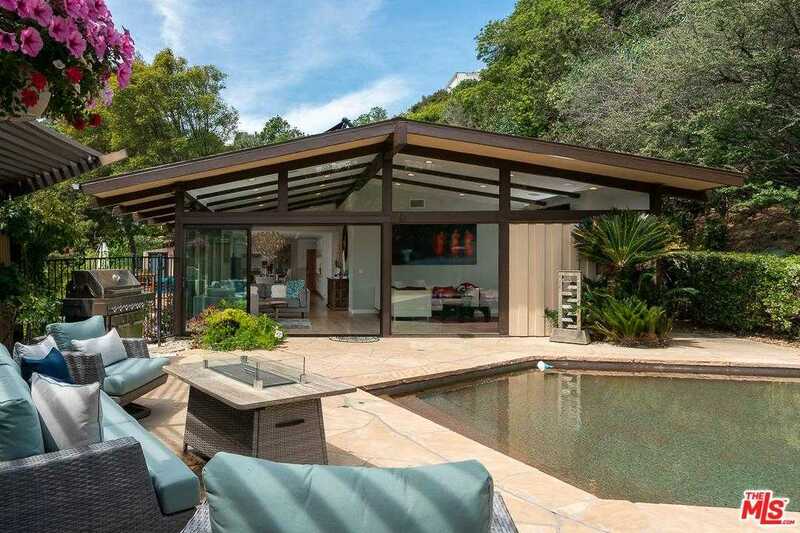 Up a long, private drive this extensively remodeled Post and Beam Classic Mid Century Modern sparkles for the most discriminating clientele looking for a peaceful, hidden treasure surrounded by nature. A two year renovation is now complete with modern amenities, all new systems including roof, retaining walls, HVAC, etc. Walls of glass create the ultimate in LA indoor/outdoor lifestyle. The great room opens to the pool and outdoor entertainment areas surrounded by lushly landscaped grounds. Upgrades include a fully loaded chef’s kitchen with custom cabinetry, caesarstone counters, center island, Fisher Paykel & Bosch appliances. The Master Retreat is beyond beautiful with large walk-in closet. BBQ around the gorgeous private pool while enjoying the quiet, tranquil views of the hills framed by iconic Mulholland Drive in the distance. Two car garage has been transformed into an amazing Guest House with vaulted ceilings and designer touches. Click on Virtual Tour tab for property video. Building size: 2714 sq ft. Please, send me more information on this property: MLS# 19453430 – $2,595,000 – 3523 Laurelvale Dr, Studio City, CA 91604. I would like to schedule a showing appointment for this property: MLS# 19453430 – $2,595,000 – 3523 Laurelvale Dr, Studio City, CA 91604.